As Fall sets in, it's the perfect time to savor the last of the summer produce. I'm always looking for easy options to throw together a quick and tasty dinner, especially as the calendar fills up and days get shorter. This meal couldn't be more simple, taking only 5-10 minutes from start to finish, and is easily adaptable to suit your tastes and ingredients on hand. 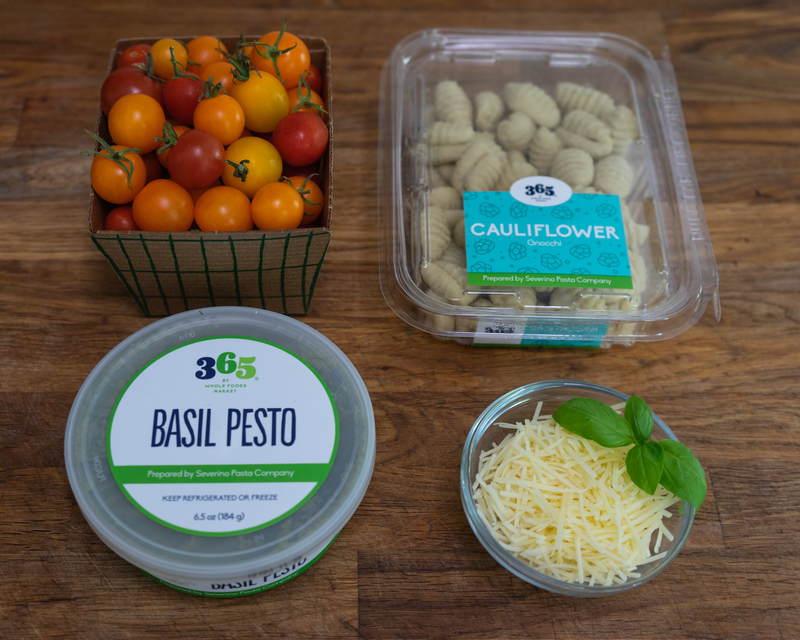 I picked up all four ingredients from Whole Foods Market 365 –– a streamlined grocery store evolved from Whole Foods and their 365 Everyday Value product line. I've been excited to try this cauliflower gnocchi since they launched their extended line of frozen fresh pasta and sauce. With tomatoes at their peak and abundant in gardens and markets, they are a natural choice to add flavor to this easy weeknight meal. Preparation is super fast and flexible. 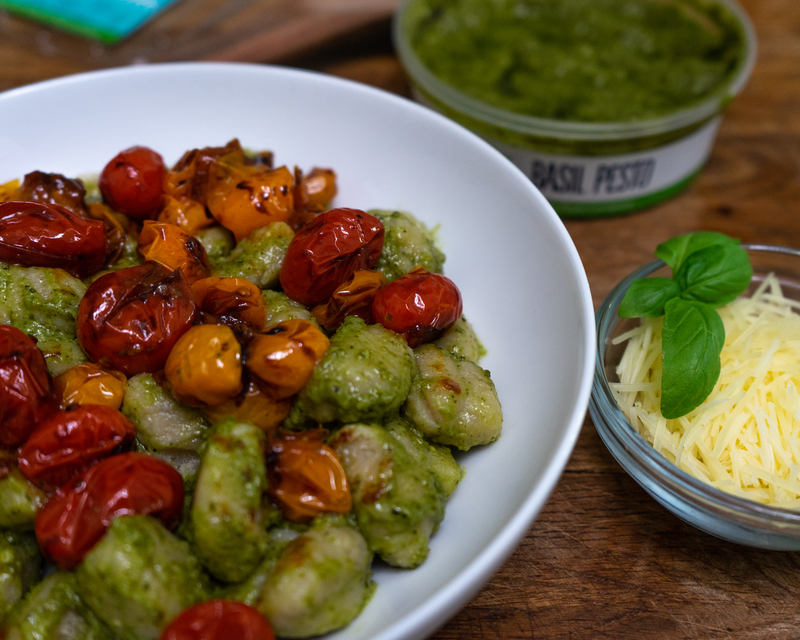 Both the cauliflower gnocchi and pesto sauce are found in the frozen section and can be stored in the freezer or refrigerator, depending on how soon you'll use them. I left mine to thaw in the refrigerator overnight so they'd be easier to work with when I was ready to make dinner. Start by heating oil over medium-high heat in a cast iron skillet and then filling a pot with water to boil. 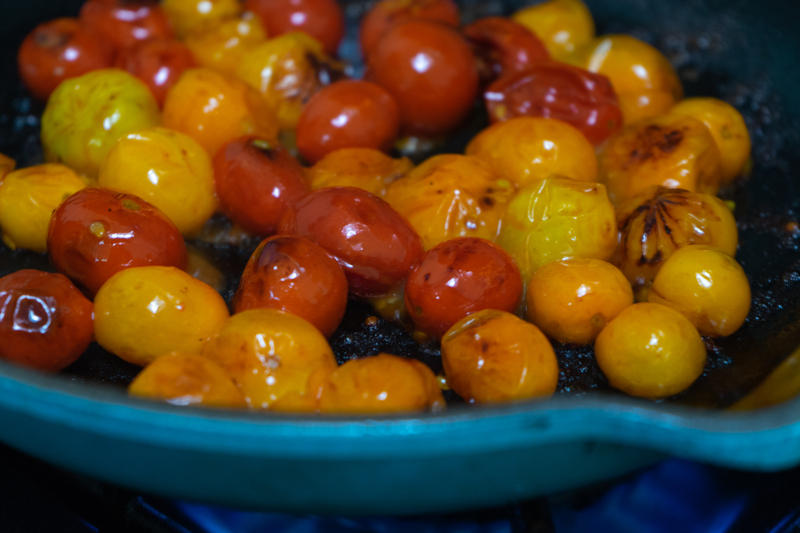 Once the water is on the burner, add the tomatoes to the skillet. If you don't have tomatoes on hand, try swapping for another vegetable. Some of my favorites include spinach, squash, peppers, and eggplant. The key to this meal is simplicity so get creative and use whatever on sale or what you have on hand. 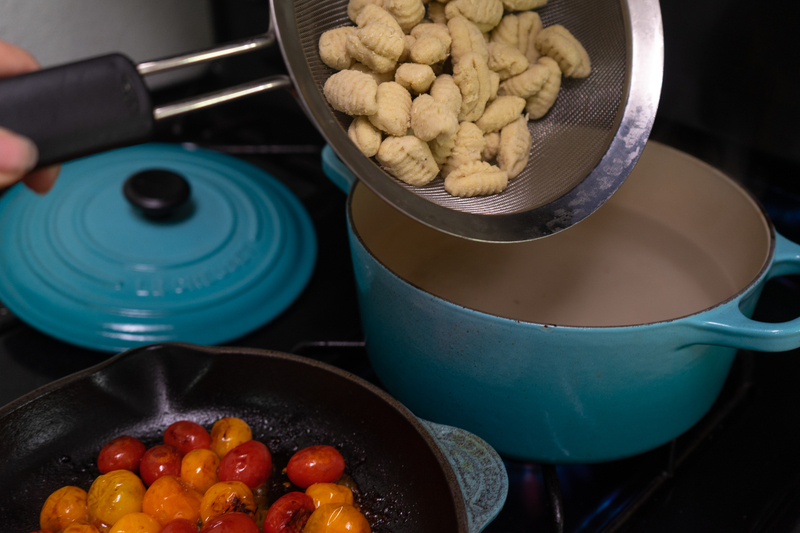 Once the water is boiling, gently place the gnocchi in the pot. It only takes 2-3 minutes to cook, depending on if started from frozen or thawed. Either way, you don't need a timer –– it happens quickly, so be prepared to remove from the burner. You'll know it's done when the gnocchi floats to the top of the water. Once they've risen, pour into a strainer and return to the warm pan and mix in a few spoonfuls of the pesto sauce. If you don't have pesto on hand, try adding a simple tomato sauce or even just some butter –– it's hard to go wrong with this cauliflower gnocchi as the base. Once you've folded in the sauce to the warm gnocchi, top with your blistered vegetables, parmesan, and you're done! It's really that simple. When I shared this on Instagram last week, many of you were excited about to try it yourselves, asking where to find it in store. Most of you are familiar with the 365-brand of items carried at Whole Foods, but many were unfamiliar with the 365 specialty stores, which are opening up around the country. Whole Foods Market 365 is a special branch of Whole Foods with its own branded stores. I shop at the Concord store, which is the first in the Bay Area. These they are popping up in cities around the country and you can find your nearest local store here! Frittata's are one of my favorite egg dishes and this Pizza Frittata is one of the most tasty I've ever concocted. Although a bit more complicated than a simple scramble or omelette, the results are far more impressive. Fritter's are also a great way to use miscellaneous scraps from your refrigerator so get creative. I came up with this recipe to satify my craving for pizza and it's absolutely worth the effort.